Cabinets are an overall asset to any kitchen. Not only do they add more storage space, they also add to its aesthetic value. The only downside to having it in your kitchen is the number of things you need to consider in getting one. Since you need these cabinets for both its aesthetic and practical uses, you also have to consider the door style, material, hardware, and frame type. Aside from these things, however, ergonomics is a big consideration. 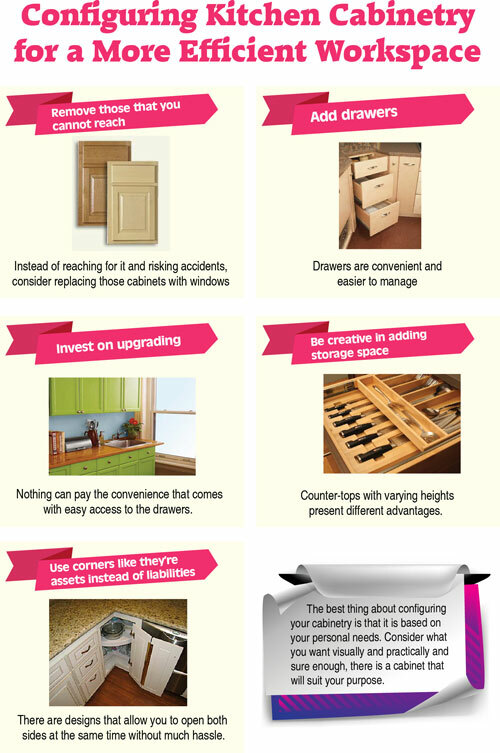 Here are some ways to configure kitchen cabinets into an efficient and suitable addition to your kitchen. Some wall cabinets are very difficult to access. Instead of reaching for it and risking accidents, consider replacing those cabinets with windows. Doing so will not only add natural view to the kitchen. It will also improve circulation and light, which can potentially help save electricity. Instead of installing difficult to reach uppers, consider installing shallow pantries instead. They are very efficient in organizing dry and canned foods. They also maximize space by using interior walls where windows cannot be installed. Where wall cabinets are needed, installing open shelves are more efficient. For these kinds of storage space, however, it is best to stock items that are often used since they are less likely to gather dust. On the other hand, if you choose to go for closed wall cabinets, consider those single-door horizontal ones that don’t require much space and effort to open or close it. Drawers are convenient and easier to manage. With doors, you need to search through the dark interior to find the item that you need. Drawers, on the other hand, basically bring the items to you. They offer the right dimensions for organizing smaller items like spoons, forks, and knives. It is also a great advantage that the items are drawn out to the light so it’s much easier to locate what you need. Corners are difficult to manage since you cannot open one side without the other side getting stuck. The good news is there are designs now that allow you to open both sides at the same time without much hassle. Since you can never avoid corners in the kitchen, might as well make the most out of it with the latest efficient corner drawers. Upgrading your cabinets into those that have drawer glides and hinges is highly recommended. Although you have to pay extra for these, nothing can pay the convenience that comes with easy access to the drawers. Counter-tops with varying heights present different advantages. For one, there is option for tall people to use the taller parts of the counter-top. Another advantage is that the taller sides of the counter-top can be used as additional space for drawers and cabinets. Also, different levelling has proven to be aesthetically pleasing. There are different ways to choose the best cabinet for your kitchen. One is to consider the requirements for each area in the room. Some require more depth and height, while others need more emphasis on the door style. Finally, the best thing about configuring your cabinetry is that it is based on your personal needs. Consider what you want visually and practically and sure enough, there is a cabinet that will suit your purpose.